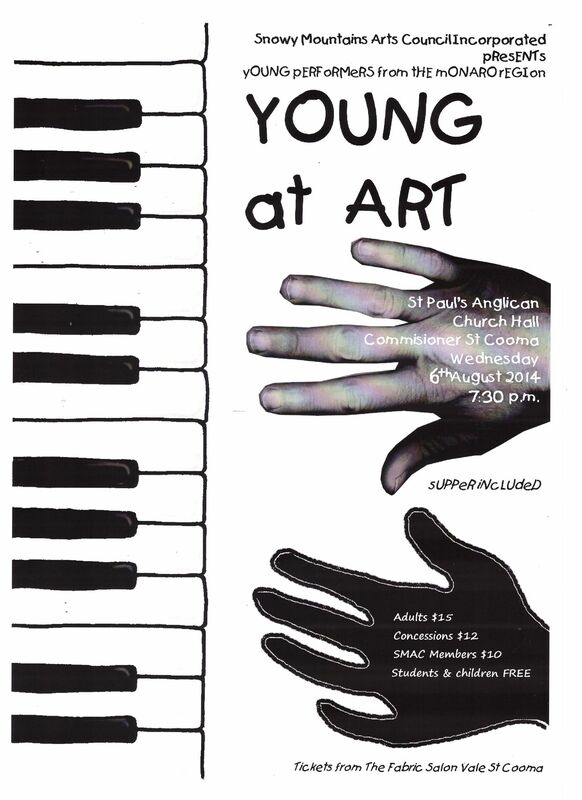 On Wednesday 6 August, Snowy Monaro Arts Council will proudly present its annual ‘Young @ Art’ concert – an opportunity for young musicians to perform to a discerning audience – at the Anglican Parish Hall in Cooma. The Arts Council for decades has been responsible for attracting and hosting high quality musical performances to the district. But seven years ago the organisation decided to publicly acknowledge the talents of local performers – in particular, very young and gifted musicians. This entry was posted in Concerts & Events, Snowy Monaro Arts Council and tagged snowy monaro arts council inc, Young At Art on July 29, 2014 by allan. 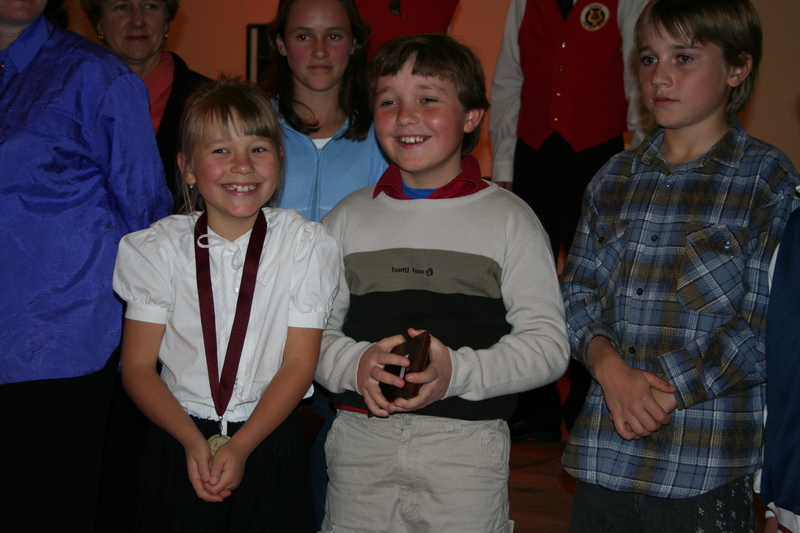 Past Cooma Music Competition Competitors-Where are they now? Cooma School of Music, viagra 60mg now celebrating its thirtieth year, decease has through this annual Cooma Music Competition given participating musicians encouragement and direction in their music studies. We feel that it has, viagra approved in a small but tangible way, been a positive influence on their future music careers. These are some of the hundreds of musicians that have participated in the Cooma Music Competition over the last nine years. Luke Tierney studied classical guitar and graduated from ANU School of Music with a Bachelor of Music Degree (BMus) , was head of the guitar department at Cranbrook School, Sydney, and now works as deputy director at the Wollongong Conservatorium of Music. Ned McPhie graduated with a (BMus) from the Australian Insitute of Music (AIM) and then went on to complete a Post Graduate Diploma in Screen Music at the Australian Film, Television and Radio School (AFTRS). 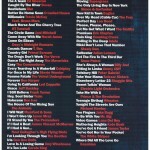 Ned is currently working as a film music composer. He also performs regularly as a solo guitarist and in his folk-punk acoustic band “The Bottlers”. Matthew Ventura is studying bassoon & flute at the ANU School of Music. 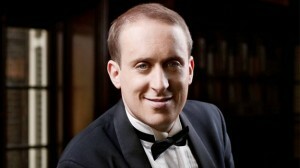 He is a Wesley Music Scholar, member of the Canberra Symphony Orchestra and soloist for the Canberra Youth Orchestra. 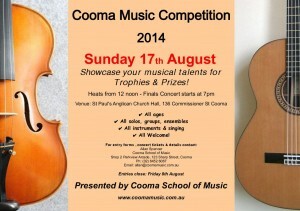 He teaches at Cooma School of Music. Emma Ventura, still at school, is teaching violin, viola and piano at Cooma School of Music. Daniel Morassutti is now drum teacher & professional drummer. John Sutton, flautist, composer and teacher, graduated with BMus(Hon) from Melbourne Conservatorium of Music in 2013. Brodie Nossiter (Alias Brodie Buttons) studied music at the Southern Cross University. He now plays extensively in a folk music band “The Button Collective”. Steve Nossiter (Brodie’s Dad) quit working as an electrician to study music at SAE Institute at Byron Bay and now works as a composer of film and ambient music. Viki Parsons is a flute and vocal teacher. She graduated from the Australian Institute of Music and is doing post graduate study at the University of Sydney. Saskia Tillers has played cello professionally in Australia, Europe and Asia. 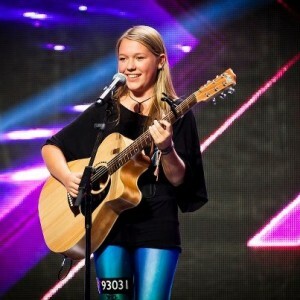 Alisha Brady has gone on to study music at the University of Southern Queensland. Owen Pearson is studying music composition and voice at the University of NSW. Vendulka Wichta, Cooma’s X Factor girl, is still at school but she’s already enjoying a flourishing music career. 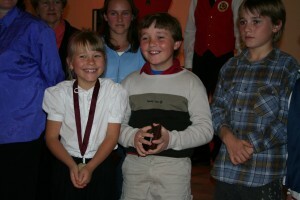 She performs regularly in music festivals around Australia. Hannah (Kit) Spencer studied the harp at ANU School of Music and graduated with a BMus(Hon). In the past year, she has been performing in Russia and Europe, and is now commencing a postgraduate Masters of Music degree in The Hague, Netherlands. 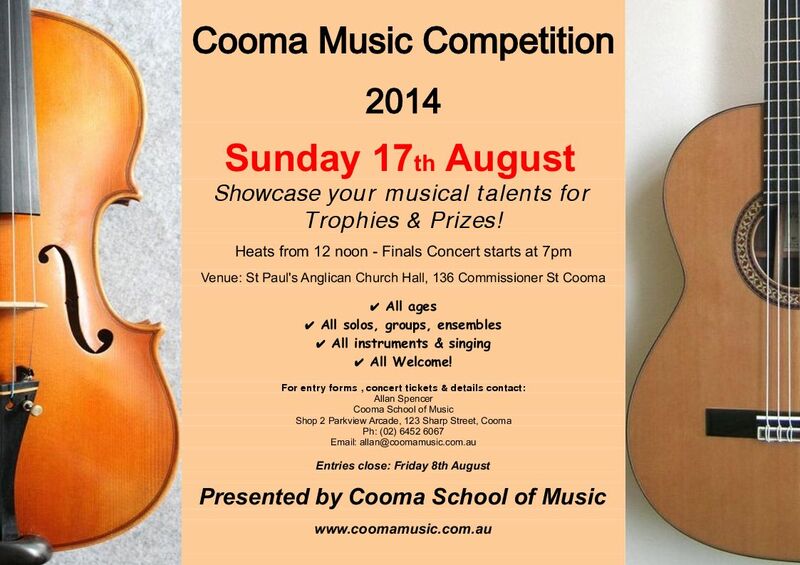 This entry was posted in Competitions and tagged cooma music competition on July 13, 2014 by allan. 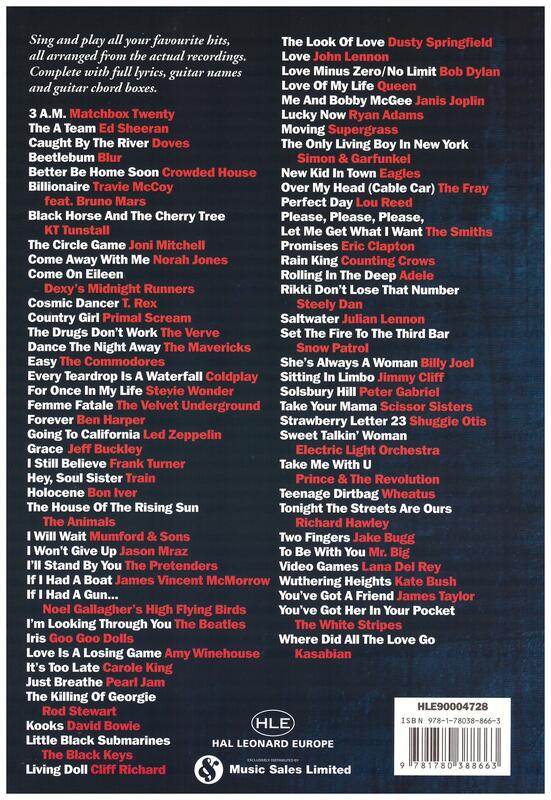 Most songs can be played with 3 or 4 chords. Musicians called this the “Three Chord Trick”. 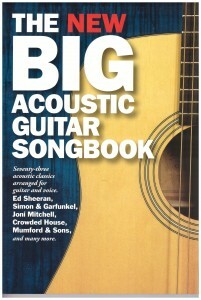 These chords are based on triads built on the first, search fourth & fifth notes of the scale you are working in. 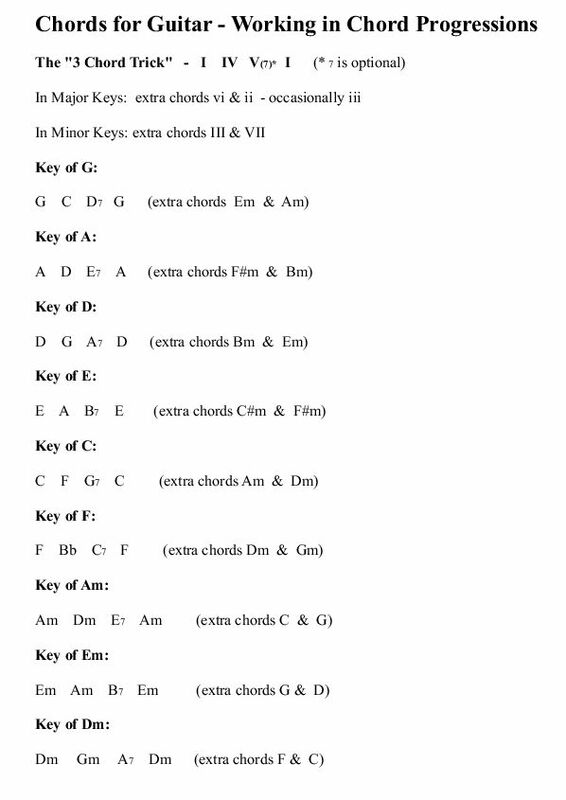 I’ve just stayed with the most common keys for guitar and added in some of the extra chords (vi & ii -occasionally iii in the Major keys and III & VII in the Minor keys). 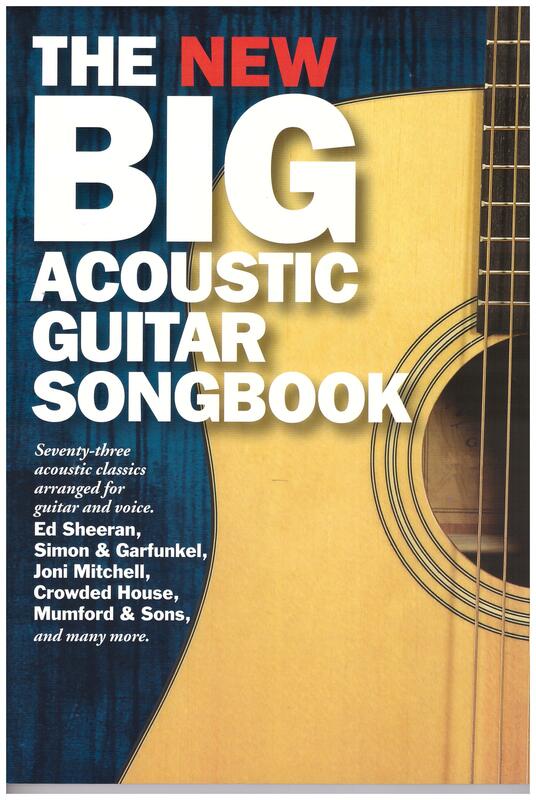 If you become familiar with these typical chord progressions you’ll be able to accompany thousands songs as well as get a deeper understanding about how harmony works in any style of diatonic music generally. This entry was posted in Asides on July 13, 2014 by allan. “…with its steely rhythms, its rattle-ty bang…”, and it became his most popular tune. At the time he wrote it, Gershwin was 26 years old. He was only 38 when he died, but his music has been recorded by countless stars over the decades, from Frank Sinatra, Bing Crosby, Judy Garland and Ella Fitzgerald, to Madonna, Amy Winehouse and Sting. 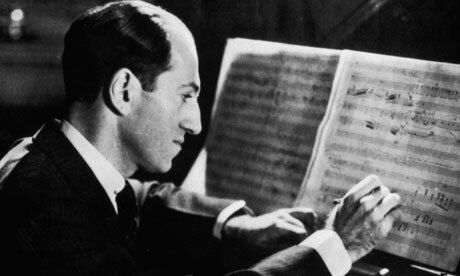 Before Gershwin died a young musician had the opportunity to perform “Rhapsody in Blue” with him. That man, then aged in his late ‘teens or early 20s, was Larry Adler, who became widely acknowledged as one of the world’s most skilled harmonica players. Adler enjoyed a very long career, was friends with people like Charlie Chaplin and Cole Porter, and he performed and recorded with composers and artists all around the world right up until he passed away at the age of 87 in 2001. In 2000 when he was 86 Adler toured in Australia, and another very young musician performed “Rhapsody in Blue” with the legend. That was Simon Tedeschi, who was then aged 19 and well on the way to becoming one of the finest musicians of his generation. This story is by way of saying that when Larry Adler described Simon Tedeschi as “the greatest Gershwin exponent I have ever seen”, it was no light compliment. And it means the Cooma audience is in for a treat when Tedeschi plays “Rhapsody in Blue” during his recital this Fridayevening, the 25th of July. Tickets for the concert are available at The Fabric Salon and are limited, so get yours early. The concert will be at the Anglican Parish Hall on Commissioner Street at 7:30pm. Supper will follow with the chance to talk with Simon Tedeschi. 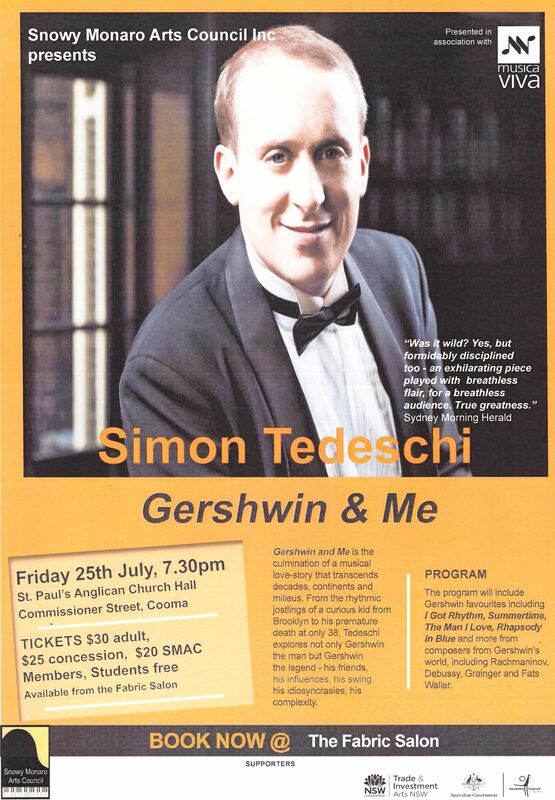 This entry was posted in Concerts & Events and tagged George Gershwin, piano concert, Simon Tedeschi, snowy monaro arts council inc on July 13, 2014 by allan. Comes with great quality neck strap, cork grease, cleaning cloth and heavy duty hard case. Plays beautifully. This entry was posted in Second Hand and tagged alto saxophone, second hand, solo on July 10, 2014 by allan.